That means that you can look up the nutrition facts for your favorite fast food anytime, anywhere! Next time you're standing in line at a fast food restaurant, pull out your phone and check the nutrition facts on FastFoodNutrition.org and make a healthy choice. 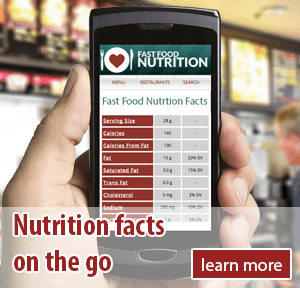 To use FastFoodNutrition.org on your mobile device, simply open your browser and navigate to www.fastfoodnutrition.org. Our website will automatically serve up a version of our site that will look great on your phone or tablet.